An order of insects composed of the moths and butterflies, characterized by wings covered with delicate scales. An order of the class Insecta that includes the butterflies, moths, and skippers; characterized by scaly wings, sucking mouth parts, and complete metamorphosis. Fig. 208 Lepidoptera . General structure. the ENDOPTERYGOTE order of insects containing butterflies and moths, characterized by the presence of scales on the wings and body. Butterflies and moths are no longer classed as separate taxa. The larvae are caterpillars, which feed mainly on plant tissues; the winged adults are usually nectar feeders and are important in pollination. Fossil Lepidoptera have been reported from a few exceptional deposits. On the Lepidoptera of Karachi and its neighborhood. Hetrocerous Lepidoptera collected in Chili by Thomas Edmonds, Esq. Despite the relative diversity of species, only a small number of studies have been devoted to identifying insects, including Lepidoptera at a species level (e.
Aunque en general en Lepidoptera la bursa copulatrix tiene la funcion principal de recibir el espermatoforo (Kristensen 2003), en el caso de la palomilla Illiberis rotundata Jordan (Zygaenidae) puede funcionar ademas como un deposito de huevos provenientes del oviducto comun, que al reabsorberse sirven como fuente de nutrientes para la supervivencia de las hembras (Koshio et al. Descriptions of twenty-two new species of Equatorial, Lepidoptera. 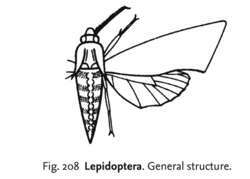 1914) A hitherto unknown organ in the ancillary appendages of the Lepidoptera (Ageronia sps. Per Quadrate Number : Per quadrate numbers were calculated by dividing number of specimen/specimens belonging to Lepidoptera with total number of quadrates per sampling from selected crops. Voss maintained a lifelong interest in Lepidoptera of northern Michigan and the Hesperiidae of the world. Coleoptera represented the majority, followed by Collembola, Hymenoptera, Diptera, Hemiptera, Lepidoptera, and Orthoptera. Prey items were Lepidoptera (moths), Hemiptera (true bugs), Coleoptera (beetles), Hymenoptera (ants, wasps, bees), Diptera (flies), Orthoptera (grasshoppers and crickets), and Insecta (all other insects). Entomologists and other biologists summarize the research into the genetics of butterflies and moths, in a volume that can be considered in many ways a follow up to the 1995 Molecular Model Systems in the Lepidoptera.